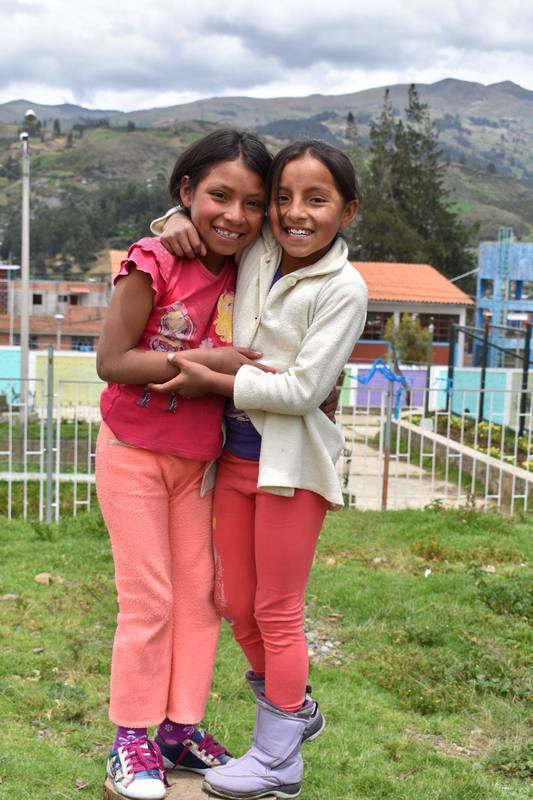 Seeds of Hope's mission is to support children living in extreme poverty in Huaráz, Perú, and to provide vocational training for those without economic means, thus enabling them to break the cycle of poverty. ​Seeds provides the students with study materials and school matriculation fees and/or medical assistance as the need arises. In addition, Seeds supports students with their further education once they graduate from high school and a number of these ex students now make up our team of Peruvian Tutors. Our program runs from our own small school in the center of Huaráz and provides a safe space for the children to do their homework and additional practice, with the help of our qualified teachers, plus local and international volunteers. Provide students with a strong academic and personal education, founded on values and principles which will improve their prospects for the future and develop their potential for independent thought. Teach our students to practice personal hygiene. Provide our students with clothes, shoes, and school equipment. Give our students the emotional support they need while they are part of the organization. Fight for the rights of the children and provide them and their families with legal assistance where needed. Teach people living in poverty the practical skills they need to make a living through selling handmade arts and crafts. Seeds of Hope is made up of a group of like-minded people who continuously strive to make a difference to the lives of children in Perú. Our team consists of our full time Peruvian Director Yuri Chavez, several graduates from the program who serve as Tutors, our International Volunteer Coordinator as well as several Board Members. Yuri was born and raised in Huaráz. Yuri has both a music and an accounting degree, teaching as a music teacher for a number of years and now working as a freelance accountant while running Seeds of Hope. Following graduation, he also spent seven years working as a teacher with different organizations involved with helping children in situations of extreme poverty. The knowledge he gained by working with these children, as well as getting to know the families of these children, gave him a profound insight into the problems of poverty-stricken children in the Áncash region, and he learned the difficulties associated with attempts to escape their socio-economic position. As a result, he founded Seeds of Hope in 2006, along with two volunteers with whom he was working with – Federica and Rocio. Federica was born and raised in Italy. She obtained a Bachelors degree in International Political Science. While studying in university she volunteered in Rwanda for a couple of months. After receiving her Masters degree in human rights she set off for Perú where she worked as a director for another NGO working with street children. While volunteering in Huaráz, she was struck by the poor social conditions of the children and their families. She along with Yuri and Rocio decided to found Seeds of Hope and help make a difference in the lives of some of the poorest children in Huaráz, Perú. She is now back working and living in Italy but is still actively involved in helping Seeds of Hope. Yury was born in the city of Huaráz, Perú. He has a Bachelors degree in Statistics and Information, and worked as a lecturer in Computing at the University of Huaraz for six years. He joined Seeds in November of 2006, and has been an essential asset to Seeds of Hope program ever since. A few years ago, he left Huaráz, Perú, and moved to Italy. Although he is now working and living in Italy, Yury still contributes to the operations of Seeds by consistently managing finances, as well as providing technological assistance when necessary. Stephanie has a first class Business & HR degree and has worked in the not-for-profit (charity) sector for six years, developing knowledge in all areas from operations to fundraising to communications. Stephanie has much experience of volunteering with children and loves to travel to new countries, so living in Peru and working with Seeds was an ideal fit. Amanda is an experienced Primary School Educator from Melbourne, Australia who has a Bachelor of Education, a Master of Education, a Post Graduate Certificate in International Education (International Baccalaureate) as well as qualifications in TEFL/TESOL and teaching Yoga. Amanda’s first experience of volunteering abroad was in 2017 at Seeds of Hope. She then went on to teach and volunteer in Nepal and Cambodia. Volunteering at Seeds was an experience very dear to her heart and so she returned to Seeds of Hope in June, 2018 in the role of International Volunteer Coordinator for the remainder of 2018. Amanda is currently living in Nepal and continues to support Seeds of Hope through coordinating donations and managing our Sponsorship Programs. If you are interested in our programs or wish to make a donation, please contact Amanda via our gmail account. Johanna was volunteering at Seeds of Hope in 2007 without really speaking any Spanish. But as she came back again and again to Huaraz, her Spanish improved and she was able to see the progress Seeds of Hope was making from year to year. Johanna has a Bachelor in Organic Agriculture, a Master in Public Policy and is right now doing her PhD in the field of school gardens and the virtual exchange between learners from school gardens from all around the world. ​In 2017 she co-founded a friend's association in Germany to support Seeds of Hope through fundraising. If you are in Germany and would like to make a donation, please contact Johanna. We are so proud of our current group of Peruvian Volunteer Tutors. All are students who have graduated from the Seeds of Hope program and are now giving back to the organization that gave so much to them. When our tutors are not teaching and helping out at Seeds they are involved in their own tertiary education and other projects. Financial assistance is always welcomed for our teaching team. Contact us for more information on how you can support them and contribute to their further education. Isabelle has a degree as a translator, and received a Masters in International Marketing Management. After climbing the corporate ladder in a market research company for eight years, she decided it was time for a big change. After 8 months she found a remarkable challenge in Huaráz, volunteering at the Seeds of Hope school. A few months quickly turned into a volunteer period of almost 2 years, where she helped shape the development of the organization, as well as providing assistance for international volunteers. Katelyn received a Bachelor's degree in Social Science and a minor in Child Development from California Polytechnic University, in San Luis Obispo, California. She first came to Huaráz in September of 2005 to volunteer with another NGO that no long exists in Huaráz. Since then, she has returned to Huaráz five times, all of which to work and volunteer at Seeds of Hope. She loves to travel and work with impoverished children all around the world. Sharon has a Bachelor's degree in English & Music, and a Masters in Children’s Literature. After teaching English in Greece, she spent six years working at Sheffield University before wanderlust struck. She then spent fifteen months traveling around the globe, and one of the places she visited was Huaráz, Perú. Upon her return to the UK, she worked for a number of universities and for non-profit organisations before finally fulfilling her long-term ambition to do voluntary work overseas. She returned to Perú, where she helped Seeds of Hope with their marketing campaigns, and acted as their volunteer coordinator for a year and half.